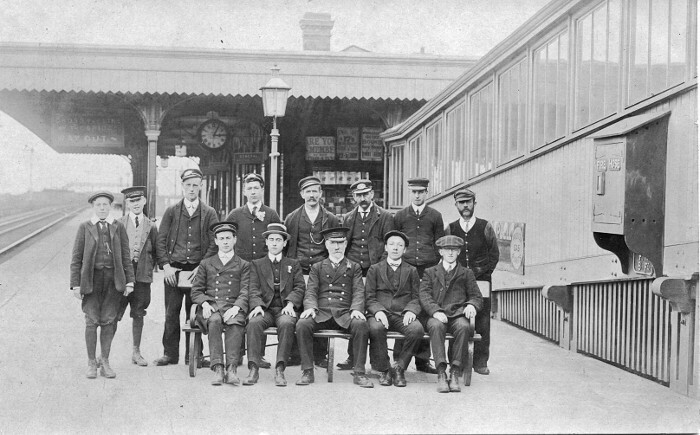 A group of staff pose at a fairly large station, wide platform. Second left is lad in Wyman & Co uniform and third from right has letters on lapel that appear to be L N W although the L is not clear. The angle of the bridge suggests ramp rather than stairs. What could be a long footbridge appears to cross the line in the distance. Some fine lamps to be seen. Can LNW ownership be confirmed along with location. My guess is the group are on the down platform of Abergele Station c.1910 or later. That platform didn't appear until the widening of 1907-09 so if it is there it couldn't be any earlier.